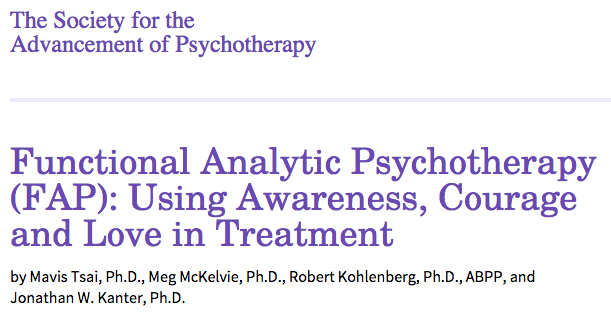 The Society for the Advancement of Psychotherapy recently published an openly available article by Tsai, McKelvie, Kohlenberg and Kanter. The authors succinctly describes the essence and technical terms of FAP. The text can be read as a therapist or researcher and for clients with a deeper interest in the theoretical terms of FAP. This article is one of the first that describes FAP and the use of middle level terms of Awareness, Courage and Love. Have a look at the full article here: Society for the Advancement of Psychotherapy.